The Economics of Money, Banking and Financial Markets 11 Edition NOTE: You are purchasing a standalone product; MyEconLab does not come packaged with this content. If you would like to purchase both the physical text and MyEconLab search for ISBN-10: 0134047346/ISBN-13: 9780134047348 . That package includes ISBN-10: 0133836797 /ISBN-13: 9780133836790 and ISBN-10: 0133862518 /ISBN-13: 9780133862515. For courses in Money and Banking or General Economics. An Analytical Framework for Understanding Financial Markets The Economics of Money, Banking and Financial Markets brings a fresh perspective to today’s major questions surrounding financial policy. 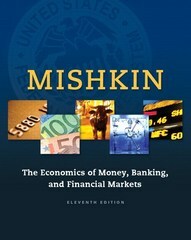 Influenced by his term as Governor of the Federal Reserve, Frederic Mishkin offers students a unique viewpoint and informed insight into the monetary policy process, the regulation and supervision of the financial system, and the internationalization of financial markets. Continuing to set the standard for money and banking courses, the Eleventh Edition provides a unifying, analytic framework for learning that fits a wide variety of syllabi. Core economic principles organize students' thinking, while current real-world examples keep them engaged and motivated. Closely integrated with the text, MyEconLab offers students the ability to study and practice what they’ve learned. Students can watch over 120 mini-lecture videos presented by the author, work problems based on the latest data in the Federal Reserve Bank of St. Louis’s FRED database, and more. Also available with MyEconLab® MyEconLab is an online homework, tutorial, and assessment program designed to work with this text to engage students and improve results. Within its structured environment, students practice what they learn, test their understanding, and pursue a personalized study plan that helps them better absorb course material and understand difficult concepts.